‘Primetime Addiction’ focuses mainly on all the great drama shows on TV, but we could all use a little break from the drama every once in a while. Ever watch a really intense episode and then need something lighthearted before you go to bed? Sometimes you just can’t go to sleep after a really good intense episode. You could always turn to Tim Allen, he’s sure to give you a good laugh. If you’ve seen ‘Home Improvement’ you know what I mean. He’s back on TV with a somewhat similar show, but this time he has three girls instead of three boys and I think the dynamic of the show is so much better than ‘Home Improvement’. 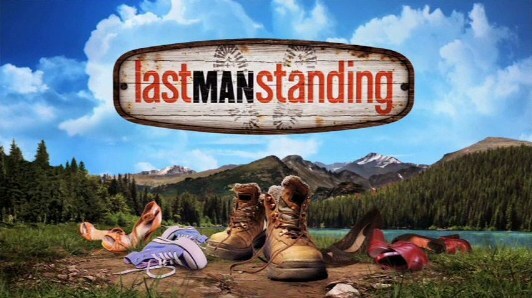 In his new show, ‘Last Man Standing’, he works in marketing at Outdoor Man and blogs about the store and his life. It’s not supposed to be about his life, but he squeezes something in that’s going on in his home life. His three daughters Kristin (Amanda Fuller, ‘Red, White and Blue’), Mandy (Molly Ephraim, ‘Paranormal Activity 2’ ) and Eve (Kaitlyn Dever, ‘J.Edgar’) are very different from each other. Kristin is the oldest and she got pregnant in high school. Mandy is the popular girl and Eve is the tomboy and kind of like the son Mike (Tim) never had. Living in a house with four women is not easy for Mike. His wife Vanessa (Nancy Travis, ‘So I Married a Max Murderer’) is a scientist and the two hardly see eye to eye on anything. Mike is a Republican and makes a lot of political jokes that are actually funny whichever party you support. Vanessa is a Democrat and she’s raised her oldest, Kristin, to be a Democrat too. Mandy’s too busy with fashion and being popular to know anything about politics and Mike is molding the mind of his youngest, Eve. I think the show has been pretty fare for the both political parties and the opposing opinions make for a very funny show, whether it’s something political or just normal every day issues. It’s a show about everyday life and the issues they deal with are in every day life. Mike and Vanessa are trying to raise three daughters and they disagree on how to do it all the time. Ed (Hector Elizondo, ‘Valentines Day’) is Mike’s boss and friend. Mike can go to work and have a break from being surrounded by women, because not many women go to Outdoor Man and he can have his guy time then. Ed is a very funny character. He’s been through multiple divorces and clearly has no idea how to handle women, so when Mike goes to him for advice, you not it’s not going to be good advice. My one complaint about this show it they changed the oldest daughter after the first season. It took me a few episodes to get use to the new Kristin, but the show has been just as funny and entertaining, so no complaints any more.